Get to know the three principles of collaborative planning: interaction, collaboration and sociability. Don't get stuck in meticulous planning, management and control. A project is a temporary social system where motivation and involvement of the members determins its success. This collaborative vision of project management promotes openness, trust and cooperation from all involved. 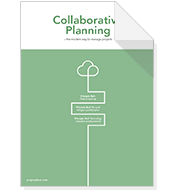 In this whitepaper you will learn more about the three pillars of collaborative planning, including practical examples from Projectplace customers.